In North America, Vector transmission of WNV occurs primarily between May and November. It peaks from late August to mid-September. This period coincides with the breeding season of mosquitoes. Breeding female mosquitoes feed on blood to obtain nutrients to produce eggs. Male mosquitoes are nectar feeders and present no direct threat. Evidence also supports the notion that infected females may lay infected eggs. Infected eggs yield infected adults. This is problematic because some infected gravid females can survive harsh winters by hibernating. Infected eggs may also survive the winter. In spring, as the temperature increases, the eggs hatch and hibernating female mosquitoes become active to infect birds, renewing the cycle of transmission. Because they are able to hibernate, infected mosquitoes or infected eggs can avoid suppression and control measures. Birds are the preferred prey of many mosquitoes. A bird's high body temperature emits more infrared energy then other animals, making them more attractive. The birds can sustain a high viral titer in the bloodstream for 1 to 4 days after exposure, spreading the virus to many mosquitoes. Humans and other animals are less attractive prey and are considered incidental hosts. The viral load in incidental hosts is too low to serve as an effective reservoir. 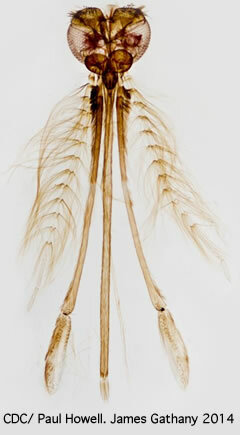 Mosquitoes of the genus Culex are the most common WNV vectors in the United States. But the virus has been isolated from many other mosquito species and blood feeding arthropods. Birds—WNV in America, was initially found in crows, but has been isolated in at least 200 different varieties of birds, including chickens and recently robins. For unknown reasons, deaths among birds from WNV infection have occurred only in the United States, Israel, Canada, and Mexico. Some invetigators believe that the virus has mutated in some locations, to be more virulent. Dogs & cats—there have been rare reports of dogs or cats that died as a result of WNV, but it rarely causes extensive illness. There is no documented evidence that suggests that person-to-person or animal-to-person transmission is possible. Dogs and cats that become infected usually recover fully. Horses—WNV disease has been documented in horses, and is cause for concern. Approximately 40% of equine WNV cases result in the death of the horse. However, a WNV DNA vaccine has been developed for horses, and it has proven to be effective as a preventive. Other vertebrates—All warm blooded terrestrial vertebrates may fall prey to mosquitoes. WNV has been reported in a number of different animals: bats, chipmunks, skunks, squirrels, and rabbits. Vector transmission of WNV occurs primarily between May and November and peaks from late August to mid-September.